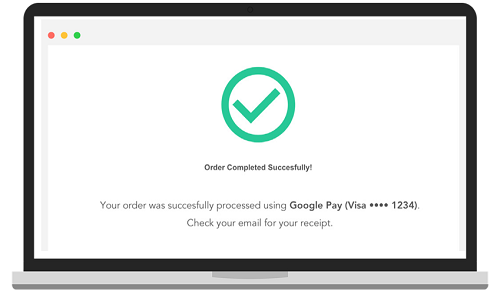 Learn how to accept Google Pay in your website or Android app. If you still have questions after reading this guide, check out our answers to [common questions](https://support.bluesnap.com/docs/faqs-mobile-wallets#section-google-pay). Google Pay™ is a simple, secure payment experience allowing shoppers make first time and recurring purchases with major credit cards (such as Mastercard, Visa, American Express, Discover) saved to their Google Account, including ones from Google Play, YouTube, Chrome, or an Android device. In addition, as a BlueSnap merchant, you don't need BlueSnap to set up your activation with Google Pay, simply sign up for a Google Pay developer account and start using it! Set up an Android app interface. A better way to pay: Google Pay is a faster, more secure way to pay on sites and in apps using payment methods saved to a Google Account. Availability: Google Pay is accepted in millions of places around the world. It's available on Android, iOS, and desktop, and you can use it in multiple browsers, including Chrome, Firefox, and Safari. 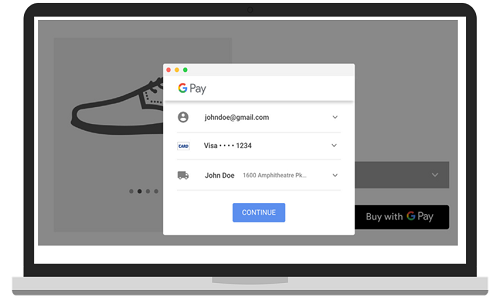 Increased conversions: Google Pay delivers frictionless checkout by eliminating the need to type billing and shipping details, increasing conversions by giving shoppers a better way to pay. Increased security: Google Pay protects your payment information with multiple layers of security, including card network tokenization. By integrating Google Pay, you agree to Google’s terms & conditions. Access this site for details. Shoppers whose issuing banks are located on this list will be eligible to purchase with Google Pay; however, shoppers using tokenized cards (cards stored on their Android device) can only use them in a subset of countries and on compatible Android devices. 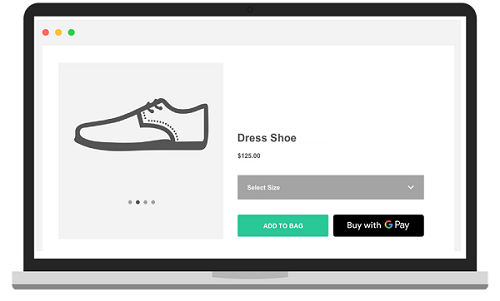 When shoppers use Google Pay in your website, they simply select an item(s) to purchase, select Google Pay as their payment method, and complete the transaction. The shopper clicks the Google Pay button on your checkout page. The Google Pay payment page opens on top of the checkout page. Here, the shopper can select their payment method, or add or change any of their billing and shipping information. After the shopper reviews and confirms the order, the checkout page provides a confirmation message. Refer to the Google Pay brand guidelines and their integration checklist when referencing their brand within your website. Follow the implementation instructions within the Tutorial section, which include creating a Google account and obtaining production access. Within Google’s tutorial, under “Choose a payment tokenization method,” you must specify BlueSnap as your payment gateway and supply your BlueSnap merchant ID, as shown in the example below. Your gatewayMerchantId is different for BlueSnap Sandbox and Production. Be sure to use the correct merchant ID to avoid processing errors. Follow the instructions here to add a Google Pay payment button. You must package the response you received from Google Pay as a base-64 encrypted string by performing the following task. This paymentToken should be sent to the BlueSnap API, as detailed in the Processing Transactions section. Implement Google Pay in your Android app using BlueSnap's Android SDK to let shoppers purchase physical items (such as groceries and clothing) or services (such as gym memberships and hotel reservations). Your Android app must be approved by Google before it’s available in the Google Play store. If you use BlueSnap’s Android SDK for your checkout, you don’t need to do any coding — just register with Google and enable this payment method in the BlueSnap Console! If you prefer not to use BlueSnap's Android SDK, you can implement Google Pay in your Android app by following Google's instructions. The Google Pay pop-up opens on top of the checkout page. Refer to the Google Pay brand guidelines and their integration checklist when referencing their brand within your Android app. If you decide to implement Google Pay in your Android app on your own (without using BlueSnap's Android SDK), follow the implementation instructions within the Tutorial section, which include creating a Google account and obtaining production access. Follow the instructions here to add a Google Pay payment button to your app. Use the following code to supply your merchant ID. Your gatewayMerchantId is specific for BlueSnap Sandbox and Production. Be sure to use the correct merchant ID to avoid processing errors. // paymentMethodData -> description: A payment method and method identifier suitable for communication to a shopper in a confirmation screen or purchase receipt. This paymentToken should be sent to the BlueSnap API, which is detailed in the Processing Transactions section. Google Pay does not provide test cards; however, you can use a “live” card within Google’s test environment. In a test environment, Google Pay returns a dummy token, which can't be charged. Sandbox supports Google Pay tokens produced by either setting (TEST or PRODUCTION), but BlueSnap's Production environment only supports PRODUCTION Google tokens. While the Google Pay API is available in many markets, tokenized cards are only available in a subset of countries and only on compatible Android devices. Refer to Google’s integration guide before testing tokenized cards. This section covers how to send the payment token data to BlueSnap to process the transaction using the Payment API (either JSON or XML). You can validate if the Google Pay payment method is activated by viewing this setting in the BlueSnap Merchant Console. Google Pay is activated by default. The Google Pay token might result in a regular Credit Card or a Tokenized Card (when the card is inserted in the Google Pay app and shoppers use their mobile to do the purchase). The API requests are the same in either case, but the responses might vary. For sales involving new shoppers, you must include the Encoded Payment Token property in an Auth Only, Auth Capture, or Create Subscription request. For sales involving returning shoppers, you must include the shopper's Vaulted Shopper ID and Encoded Payment Token property in an Auth Only, Auth Capture, or Create Subscription request.